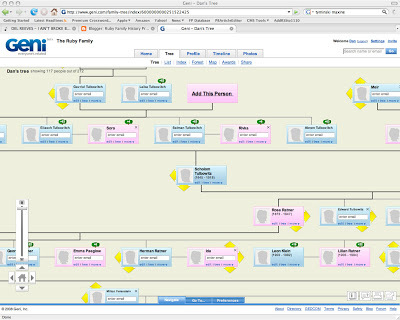 Walter asked about what kind of graphics we can do with the family tree. The program I use has a lot of output options. Most are very large, either horizontally or vertically. One format called a fan chart is compact enough for the confines of the blog. 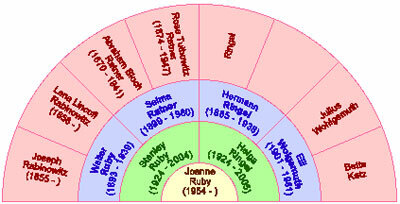 As an example, here is a four-generation fan chart for Joanne. You can see we have a lot of work to do on the Herman Ringel sector. Hopefully, there will soon be a Ze'ev interview. 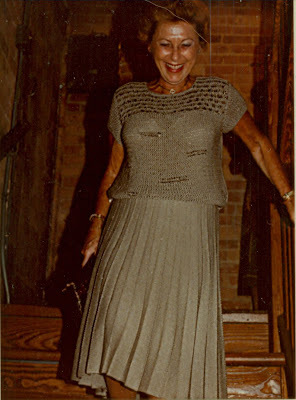 I spoke to Joanne a little while ago and was touched to hear of the skype phone call she and Dan held with the entire Sharon clan--more than 25 of them according to Jo--gathered in Afeq together with Lani. Good for Jo and Lani for making this happen for all of us. I'll let Jo and Dan describe it, but Jo's account to me was of a magical coming together and of love and appreciation of each other on all sides. 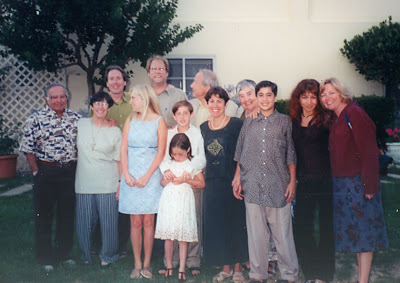 Great that patriarch Ze'ev and matriarch Penina could be there and that Lani got to meet them and all the rest of the wonderful Sharons; Raya and Amiram, Ruti (who I havent seen in 30 years) and her son Yuval, sweet Dalit and Tal and their brood, Ahikam and Gali and their katanchik Netta, and Karmit (with a toddler not yet born when I was in Israel in 06) and Nir, who was then in the army--all of them and more (sorry to those I didnt mention) gathered improbably at Raya and Amiram's small house of the edge of the kibbutz with that view acorss the fields to the hills of Galilee, all there to appreciate Lani and to reconnect--all very powerful stuff. 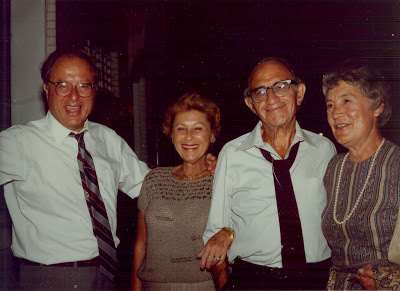 I know Ahikam and others in our Israeli family have connected palpably to the genealogy search and has contributed a lot of information and so that project as pushed forward by Dan has made a major contribution to us all coming together. Wow, zeh mamash kef, be'emet yotzei meen ha klal--the whole thing is a real high, totally out of the ordinary. Family, I love all of you, those with us now and those who have departed, our dear parents and so many others and dare I say, those yet to come. What a compelling sense of connection and belonging.